ON SELECT IN STORE LOVESEATS. WHILE SUPPLIES LAST. Hop On In To Your Preferred Provider For All Your Water Needs! Located 1-1/2 Blocks Off Of North State St.
*Tax, Title, License & Doc Fee Additional. Subject To Prior Sale. Sale Prices Effective Thru 4-30-19. We Service AND Maintain ALL GM Makes And Models Every Day! The Rosecke Family has been servicing the water industry for over 25 years. We take pride in our customer service. We treat you like family. tractortown.net Special Husqvarna Financing options are available for qualified applicants on in the U.S. only. Financing is only available on new equipment purchases. Limited time offer at participating dealers only. Some restrictions apply. *Payments based on 7.9% APR for 36 months to qualified applicants, tax & promo fee included. Free Blade Sharpening One Blade Per Coupon. One Coupon per Visit. Blade Must Be Off Unit. Expires 4-27-19. 30% OFF ALL FRAMES & LENSES Includes designer frames, bifocals and progressives. Fertilizing & Weed Control Guaranteed More For Your Money! BELVIDERE I 304 NORTH STATE ST. I 815-544-3431 ROCKFORD I 6410 EAST STATE ST. (INSIDE SCHNUCKS) I 815-397-2020 SOME RESTRICTIONS APPLY. NOT FOR USE WITH MOST INSURANCE PLANS. Need answers as to why pain has you sidelined? Now Offering complimentary INjury Screens Let us take the worry out of an injury with a complimentary screen. Our process will give you the answers you need to get you on the road to recovery. No commitments. Complimentary. Call today! â&#x20AC;˘ Outstanding Local Service â&#x20AC;˘ Committed To Finding The Coverage That Is Right For You â&#x20AC;˘ Call For A FREE Quote Today Unbeatable rates for auto & home insurance. 16 years serving Belvidere & Boone County Online rates from 20 different companies. For Your Home Add Safety, Value, & Natural Light. Her first car. Their college savings fund. Your retirement. Life moves fast. J&L TREE REMOVAL: Trimming, brush removal. Free estimates, fully insured. Cheapest rates around. 815-281-2351, 815-281-2352. HELP WANTED Full-Time Labor and Cement Finisher, must have a valid drivers license. CDL preferred. health insurance and retirement benefits, experience preferred. Contact Gary 815544-2661. Tax Refund? • Are you paying bills, but find yourself: STILL IN DEBT? • Will you be doing this YEAR AFTER YEAR? • Perhaps NOW is the time for a Fresh Start. ATTORNEY HENRY REPAY Local, personal & available to meet in person! 930 W. Locust St., Belvidere • (815) 547-3369 We are a debt relief agency. We help people file for bankruptcy under the Bankruptcy Code. Offer expires 6-14-19. *On a qualifying system purchase. Lennox system rebate offers range from $200 to $1700. Some restrictions apply. One offer available per qualifying purchase. See your local Lennox Dealer or www.lennox.com for details. COMPUTER VIRUS REMOVAL and performance tuning. Top rated and local computer and laptop repair. AIDA Electronics, 13549 Julie Drive, Poplar Grove, 815-765-0300, aidaelectronics. com. FOR SALE: Hay rack 15 feet. Restored $1300. Picture listed on craigslist. Call 815-289-8322. HELP WANTED Full or Part Time, includes nights and weekends. Experience in liquor and retail necessary. Apply within. House of Bottles, 1500 N State Street, Belvidere. 4.99 Limit 1. Must present coupon. Limit 2, must present coupon. 99¢ Limit 1. Must present coupon. 5.99 Limit 2, must present coupon. Faith. Love. Peace. May your heart bloom with the many blessings of this holy season at Easter & always. We wish you a joyous holiday. Visit Us At www.belviderefamilyymca.org for all the details! Ensure An Efficient & Trouble-Free System For The Summer. We Protect Your Legal Rights. We Also Offer Smart Insurance Policies That Will Protect Everything That Is Important To You. Looking for person for personal care. $13 per hour, must provide personal references. Full/part time 18+ hours. WE SERVICE ALL MAKES & MODELS AND HAVE A FULL PARTS DEPARTMENT. G at h er Wit h Fr ie n ds In O ur Good Luck Belvidere! Bee r G arde n ! 111 Buchanan St., Belvidere Pl ay S lo ts ! 8094 Fairgrounds Rd. Belvidere OPEN 7-5 M-F, 7-12 SAT. a division of KML Enterprises, Inc.
GIRLS’ TRACK: Top Row L-R: Jaclyn McDonald, Myle Rigsby-Ransom, Kayle Mickey, Paolo Medina, Kiana Staton, Emily Jungels, Rebecca Kolk, Elly Heimer. Next Row Down L-R: Naomi Castro, Grace Reza, Sydney Porter, Miriam Alvarez, Allie Rodriguez, Emma Salley, Mariah Perez, Allison Keller, Makaila Rodgers. Next Row Down L-R: Journie Manzella, Faith Allen, Becca Colson, Yaritza Carrillo, Jena Mogenis, Amanda White, Hannah Vierke, Mylze Medrano, Kim Rico, Delaney Hausen. Next Row Down L-R: Coach John Deery, Head Coach Duey Astling, Katey Wallace, Jazmine Manzella, Jessica Rico, Alliyah Lebensorger, Janell Richards, Caitlyn Swimelar, Leslie Romaniz, Coach Aaron Essex, Coach Tyler Erwin. Next Row Down L-R: Monica Hernandez, Briyanna Morris, Autumn Pryzbyla, Marissa Medina, Kaleigh Inniss, Makayla Medina, Allison White, Emma Wallace, Jackie Arroyo, Anahi Estrada. Next Row Down L-R: Jadeyn Ward, Desiray Beaudet, Miriam Estrada, Chloe Konieczki. G OOD LU C K ! Hub Barber Shop 402 S. State St.
Houston Daringer, Jack Riley, Rob Bland, Dane Jankiewicz. Next Row Down L-R: Flavio Rosas, Kris Worden, Coach Bahling, Coach Whitehead, Coach Salley, Coach Martin, Coach Steinkamp, Nick Fiore. Next Row Down L-R: Hunter DeBruyne, Chris Boose, Jason Martin, Anthony Girone, Cesar Segura, Alex Zediker, Owen Hunter, Ramses Baez-Tejeda, Tony Haras. Next Row Down L-R: Dustin Gomez, Jonathan Allen, Gabriel Motos, Jack Courtney, Octavio Lares, Ernesto Sabido. GIRLS’ SOCCER: Top Row L-R: Coach Horteales, Karina Molina, Geovanna Ibarra, Melissa Montoya Parra, Stephanie Anacelto, Coach Stevens. Next Row Down L-R: Leslie Hernandez, Kimberly Rivera, Giselle Lopez, Guadalupe Garcia, Aracely Hererra, Abigail White, Edith Ruiz. Next Row Down L-R: Yordanos Gardner, Aliyah White, Emily Mancillas, Clara Abarca, Alyssa Cerna. Girls’ Track: Top Row L-R: Isabella Kazluski, Paige Lambright, Jada Garza, Chelsey Recendez, Linda Evans, Madison Diercks, Katie Luna, Natalie Horagan, Sarah Hulstedt, Stephanie Roman. Next Row Down L-R: Anna Hornick, Alyssa Bird, Anna Sida, Ella Dixon, Emily Dodeler, Grace Chadwick, Haley Dahl, Sam Allen, Crystal Sotelo, Gloria Oteng-Bediako, Blanca Casillas. Next Row Down L-R: Anna Hulstedt, Dellana Muck, Linnea Goymerac, Addison Fielding, Isabel Limones, Grace McCutcheon, Hunter Vinke, Emerson Bengston, Olivia Frank. Madeline McClain, Michaela Sena, Mackenzie Larson. Next Row Down L-R: Coach Husser, Coach Downey, Sydnie Elder, Kylie Gilbertson, Caitlin Corso, Bonnie Konopka, Karyna Mendoza, Anja Chen, Ayanna Wallace, Kayla Hesano, Emily Dahl, Coach Nelson, Coach Hunter. Next Row Down L-R: Samantha Slife, Dalila Medina, Ximena Lugo, Jazlyn Bengtson, Lucia Rodriquez Romero, Noemi Ruiz, Samantha Thomas, Madalyn Taskey, Mary-Margaret Lundquist, Citalli Perez, Paola Hernandez, Maria Rosas, Rylee Klunk, Emma LaMarca. Next Row Down L-R: Montserral Arellano, Soraya Cardona, Gianna Sagona, BrookeLyn Messenger, Ihtzel Perez, Nixie Lopez-Leon. Not Pictured: Molly Carrick, Jillian Chamberlain, Natalia Rudawski, Sofia Zeman, Samantha Baker, Anastasia Glee, Kylee Johnson, Koral Koller. Barr’s Flowers BOYS’ TRACK: Top Row: Michael Standish, Cal Taylor, RJ Fashingbauer, Christian Molosz, Kyle Keompfer, Matt Albrecht, Andrin Fahrig, Matt Bucher, Adam Hill, Ramiro Verastegui. Next Row Down L-R: Zander Casis, Jayden Mitchell, Natt Williams, Cullen White, Joseph Epps, Trevor Mattson, Chance Risse, Zach Sederquist, Hayden Zaluckyj, Josh Triplett, Giovani Mendoza. Next Row Down L-R: Caden McNulty, William Lopez, Dakota Westman, Luke Smith, Tristan Powers, Ariel Gonzalez, Ryan McGinnis, Thomas Wenger, Elliott Powers, Jacob Rudawski, Noah Anderson, Steve Brown. Next Row Down L-R: Coach Babcock, Coach Pivoras, Coach Yunk, Ben Potter, Allen Johnson, Kevin Mulhall, Mason Chapman, Tavione Wilson, James Murphy, Jonathon Powell, Coach Chapman, Coach O’Hara, Coach Leonard. Next Row Down L-R: Eric Rodriguez, Aleczander Hodzic, Marco Tarozzi, Myles Vining, John Macaluso, Billy Sanchez, Cooper Engelhard, Brian Ackerman, Max Beutel, Nick Lenzen, Rico Alcantara, Aiden Massman, Jesus Hernandez, Hunter Wirth. Next Row Down L-R: Angel Ramirez, Brandon Massman, Zach Markee. GIRLS’ SOCCER: Top Row L-R: Katrina Kazluski, Arianna Wagner, Grace Mitchell, Maggie O’Brien, Olivia Zalucky, Remy Bice. Next Row Down L-R: Coach Naff, Brinley Hefty, Olivia Hart, Evelyn Marchini, Ada Parker, Hannah Beffa, Coach Figueroa. Next Row Down L-R: Brandon Burke - Mgr., Lola Beary, Alex Schenk, Hailie Schafman, Morgan Dent, Jaedan Aguilera - Mgr. Next Row Down L-R: Anaid Camacho-Aguilar, Jacquelyn Uribe, Evette Tamayo. Visit www.boonecountyshopper.com & click on the Carlson Craft tab to place your order today! In CAPRON and POPLAR GROVE! We will reopen Monday at 8 AM. Our regular deadlines will apply for our April 25th issue. Noon on Monday for Display Ads. Noon on Tuesday for Line Ads. Visit WWW.HNHSTORAGE.COM If you need the space, we’ve got the Place! We Offer Easy Online Payments! Donald Loos 815-719-6908 NEED PAINTING? Interior and exterior. Local family owned and operated. Call All About Painting, 815-975-9692. FOR SALE: 2010 Chevy Impala. Good solid runner, front wheel drive. No rust, flex fuel. 148K. Asking $3500. Call to see. 815621-3654. A & G HAULING and clean up. Clean out garages, basements, etc. Reasonable rates. You call, we haul! Arnie 815-2227072, or Gary 815-979-1075. City Of Belvidere Street Department Operator/Laborer Applications will be received until 5:00 PM on Tuesday, April 30, 2019 for a full time Street Department Operator/Laborer. Minimum qualifications are: High School graduate; must have a Class “A” CDL or ability to attain within six months of hire; must have extensive knowledge of methods, practices & techniques involved in the maintenance of municipal street & storm sewer system; must have ability to operate various machinery & equipment associated with street & storm sewer maintenance & operations; must have the ability to read & understand various plans related to street & storm sewer maintenance & operations. Starting salary is $24.03 per hour. Interested candidates shall submit a completed application form to the Public Works Department, 401 Whitney Boulevard, Belvidere, IL 61008 by no later than 5:00 PM on April 30, 2019. Applications may be submitted in person or by mail. Email applications will not be accepted. The City of Belvidere is an equal employment opportunity employer. Reasonable accommodations are available on request. FILL Your FREEZER With Your TAX REFUND! HIRING PART TIME General Maintenance/Custodian. Community Building Complex of Boone County. Weekday morning hours, 20-25 hours per week $13$14 per hour depending on experience. Applications available at 111 W. 1st Street, Belvidere. Or send resume 111 W. 1st Street, Belvidere. 815-547-3928. Start Driving In Just A Few Weeks Affordable Rates • Easy Payment Plan Classes Are Filling Fast! Call Today! We Need Your Help To Keep... BOONE COUNTY SAFE! Thinking Of Buying, Selling Or Investment Property? Or Call One Of These Real Estate Specialists Today! FOR RENT: Large house. Three bedrooms, 1.5 Bath with one car garage, large yard. $1,250 per month plus equal security deposit. Tenant pays all utilities, No pets. Application requires credit, criminal, and employment background checks on all adults- $50 each, non-refundable. 815-222-4051. ROOM FOR RENT with house to share. All utilities included, with cable and wifi. Si habla espanol 630-544-7224. Northern Illinois’ Largest & Finest Real Estate Source! FOR RENT 2 bedroom duplex, 2 story, large yard, off street parking. $650 month. No pets. Call 608-604-0791. VERY LARGE PUBLIC AUCTION SATURDAY, APRIL 20TH, 2019 RUNNING TWO RINGS! 9:00 AM Lunch by: Relish the Dog Comfort Station Available LOCATION: Boone Co. Fairgrounds, 8847 Rt. 76, 1 mi. north of Belvidere. Located in the Goat Barn near South End. Plenty of Parking! JD TRACTOR & OTHER FARM EQUIP., 1988 PROCRAFT BASS BOAT, COINS, STERLING, ANTIQUES, COLLECTIBLES, PRIMITIVES, HOUSEHOLD, YARD, TOOLS, MISC. & MORE!! TRACTOR & EQUIP. TO BE SOLD AT 11:00 SHARP FOLLOWED BY BOAT TERMS: Cash or checks w/proper I.D. Visa, Mastercard & Discover accepted. 9% Buyers Premium w 4% discount for cash or check. No Buyer’s Premium on Farm Equipment Only!! No property to be removed until settled for. All items sold “AS IS”. Number system will be used. Must have Driver’s License or Valid I.D. for registration. Lee Auction Service is not responsible for accidents or items after purchase. Announcements day of sale prevail over written material. Visit our website at www.leeauctionservice.com & check out Auction Look or AuctionZip for pictures & more info. I’m ready to help. There’s never a good time for an accident to happen. But when it does, you can count on me to be there quickly so you can get your life back to normal. GET TO A BETTER STATE™. CALL ME TODAY. SERVICE PKG. Join Our Maintenance Programs With All The Benefits! FOR SALE Enclosed 8’ x 5’ trailer. Best offer 815-298-2647. GARDEN PRAIRIE ANNUAL cemetery meeting is being held April 24th at 6PM at the Garden Prairie Church. LOOKING FOR Landscape Laborer and Groundsmen for tree removal. Must have license. J&A Lawn & Landscape 815544-4993. CA LL NOW FOR S PR ING S PEC IA LS! 2544 N. Boone School Rd., Caledonia, IL (Located E. of Caledonia Rd. or W. of Rt. 76) Large 2-Ring Auction! Antiques & Collectibles; Farm Primitives; Americana Jockey Cast Iron Lamp Post; Oak Show Case & Country Store; Coin-Op Machines; Signs & Advertising; Cupboards & Furniture; Vintage Toys; Train & Slot Car Sets; Vaseline Glassware & Fine China; Roseville Pottery; Swords & Knives; Old Military; Household Furnishings; Pal Assist Lift; Santa Collection; Tools & Shop Equip. ; Lawn & Garden; Much More. Unpacking (100) boxes in storage from the Harvard Antique Mall! HACK’S AUCTION & REALTY SERVICE, INC.
Visit www.boonecountyshopper.com to view auction listings for our participating auctioneers. Auction listings are updated weekly. POSTCARD Pre-Season Service On Sale! Grain Sorghum & Seed Corn Want more pheasants on your farm? Plant more seed for extra food plots! For More Information, Please Call 815-871-8325 Sponsored by Kishwaukee Chapter 157 of Pheasants Forever. Thanks to everyone for your support in making our Pancake Breakfast a success. PERSONAL WANT AD Deadline: No later than noon on Tuesdays, for Thursday publication. Must be paid in advance (cash, check, Visa, MasterCard, American Express or Discover). 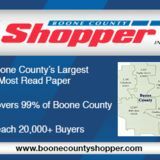 Call The Boone County Shopper at 815544-2166 or visit our website at www.boonecountyshopper.com SPRING CLEAN UP and mowing. Shade trees available. Mulching available, decorative and premium dark mulch. 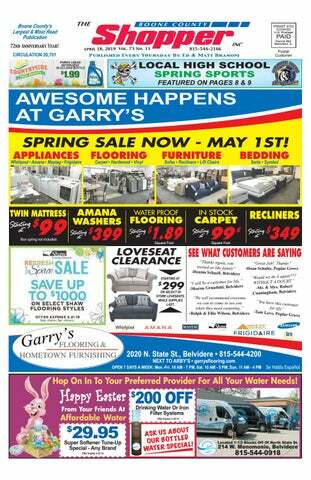 Call now for specials, 815-289-8322. Friday Fish Fry 4:30- 7 PM Featuring Traditional, Baked or Beer Battered Cod; Perch; Walleye; Shrimp or Chicken APRIL 19th - SALMON LOAF AVAILABLE! Enter to Win Insignia Fire Edition 50” Smart TV! When you purchase a dinner or breakfast. * Each time you attend one of the VFW/Boone County Veterans Club dinners or breakfasts you can enter your name into a drawing. Drawing will be held Aug. 31st. *One entry per person per paid meal. $6.00, 4:30 - 6:30 PM. Includes vegetable, dessert & coffee. To go meals no extra charge. NOW ACCEPTING RESERVATIONS FOR EASTER! $8.00, 4:30 - 6:30 PM. Includes vegetable, dessert & coffee. To go meals no extra charge. V-8, Front Wheel Drive, Automatic, Blue, Very Clean. IT’S ALL AT THE VFW! Quinceañeras • Weddings Anniversaries • Birthdays Graduations • Baptisms Banquets • Meeting Rooms We can hold outside events too!  John continues to battle with cancer starting in 2015. He has gone through surgeries, went through 12 rounds of chemo, spent over 2 months in the hospital, & is facing more radiation & chemotherapy in 2019. His friends & family are hosting a benefit to help offset some of the bills he has, & continues to accrue. Daily events will include a range of live entertainment to community events & a special theme lunch. Lunch tickets are available for purchase. All scheduled performances will be at 2 PM. All events are open to the public. BELVIDERE MOOSE LODGE #295 575 Beloit Rd. Doors Open At 6:45 AM Continental Breakfast served at 7:00 AM Message by Kristi Leigh Phillips, The Grove Fellowship Special prayers for Belvidere & North Boone School Districts. No charge for admission, free-will offering. Vendor/Craft Show 11am-5pm Gold Canyon, Paparazzi, Avon, Scentsy, Damsel In Defense, Thirty One, Diplicious, Traveling Vineyard, Hello Friend, Handmade Blankets and Crafts, Woodworking, and More! !1/2 Price Pizzas W O W EVERY FRIDAY • SATURDAY • SUNDAY THIN OR REGULAR CRUST BUILD YOUR OWN Excludes Big Daddy. * Includes Up To 5 Quarts Of Conventional Oil And Acdelco Filter. Diesels & Synthetic Oil May Be Higher If Applicable. Taxes & Disposal Fee Extra. Coupon Must Be Presented At Check-In. Price Could Vary For Certain Makes And Models. Expires 4-24-19. Ext. Cab, Only 44,000 Miles #1615B JUST IN! *Plus Tax, Title, License & Doc. Cannot Be Combined With Any Other Offers. Pictures For Illustration Purposes Only. Offers End 4-24-19. **Plus Tax, Title, License & Doc. All Incentives, Rebates & Discounts Applied. Including Loyalty/Conquest Discounts. Cannot Be Combined With Any Other Offers. Chicagoland Area Buyers When You Finance Through GM Financial. Pictures For Illustration Purposes Only. Offers End 4-24-19.